You can reserve your items online to be paid for and collected from our showroom. Your item will be available for collection one hour after reservation and will be held until the end of the following day. 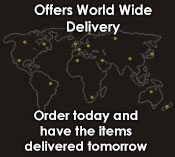 This offers all the convenience of buying online without the need to wait at home for your delivery. Click & Collect orders are ready to collect immediately.